Looking at the shape it is in with its age, I wouldn't change a thing. Its all appricots & sunshine baby, appricots & sunshine..
Last edited by panhead4411; 07-20-2018 at 08:18 AM. Took the JKU to Silver Lake Sand Dunes in Michigan last week. Was a blast, but I doubt I will go back. Very harsh for a basically stock suspension. Had to pull out the Raptor. 89 and 93 XJ owner here. I think the bulletproof moniker came from a lot of those early to mid 90's cherokees hitting 300k with minor problems. I can attest to that fact with my 93. It had most of the original core engine parts in it before I quit driving it at 365k. It was starting to need a bunch of work and instead of putting the money in the Jeep I bought a truck and the Jeep turned into a backyard trail rig. I still have it. It needs a few things to get up and going again but for the most part it would crank right up. I must have been a lucky one as it didn't need much work outside of basic maintenance. It did burn some oil boy. Towards the end I was changing oil every 4-5 weeks. It would let me know when it was time from the sound of the lifters/rockers sticking and rattling. But a fresh oil change and she was puring like a kitten again. I drive a full size truck now and it would be hard to go back. The only thing I really miss is that turning radius. You can whip those into parking spots like it ain't no thing. I can't really comment much on the newer jeeps aside from I see a lot of people driving them around these days. They sure have become popular. It's good to hear the 4 door wranglers (JKU?) are still decently built. I am sad to hear they got rid of the 4.0L though. Well I am making the switch. What the heck. 20 years with a full size pickup is a good run. Wrangler JL Unlimited. Couldn't do the Sahara, just don't like the fenders paint matched. Loved the Rubicon, but seriously, I don't find rocks very often, I tend to play in the mud. Last edited by DPrekel; 09-20-2018 at 03:15 PM. The new JL is a fantastic rig. I test drove one the other day for ****s and giggles, and I adore it. The price tag is tough to stomach, but really it's not outrageous compared to everything else comparable and for an SUV that's perfectly comfortable to use as a daily driver but can still outdo anything else on the market offroad, it's not unreasonable. 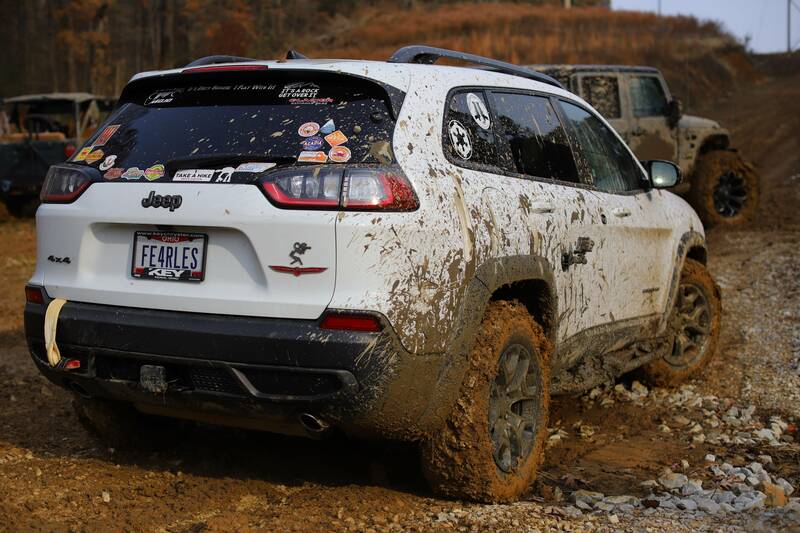 I'm a fan of my Cherokee Trailhawk. Great daily driver and moderate wheeler.